Pink walls distinguish the girl’s ward of the former Rockland State Hospital children’s building. A coffee mug seems out of place in this heavily decayed section of the hospital. The squat, maze-like ward was constructed in 1929 to house the youngest subset of Rockland State Hospital’s population. (The history of the institution and its notable bowling alley were outlined in a previous post.) 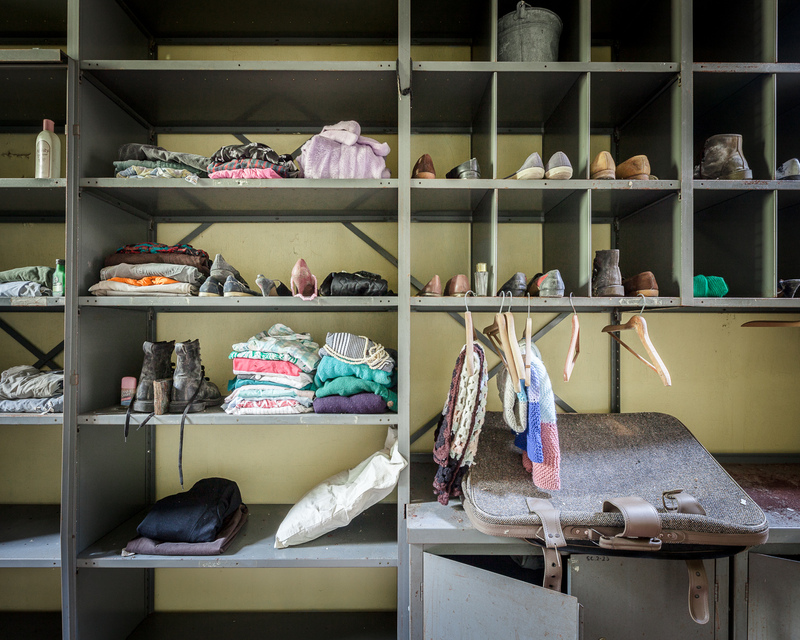 Though it hasn’t been used to house mentally ill children since the 1960s and 70s, it continued to serve the needs of kids and families in recent decades. Beginning in the 1980s it was used as a day care center for children of RPC employees called “Kid’s Corner.” In 1998, sections of the building were used for a program called “Under the Weather,” which provided free care to moderately sick kids, enabling their parents to get back to work while their children recuperated. These valuable programs were abruptly closed by the Department of Mental Health in 2008 for budgetary reasons. This section of the building was last used in the early 2000s as a day care center. A Peanuts mural from the 90s or early 00s would have been in poor taste several decades earlier. All of these developments can be traced through the hospital’s extensive collection of murals. They vary greatly in quality and subject matter, but all represent a concerted effort by founders and staff to brighten up the institutional halls over the years. 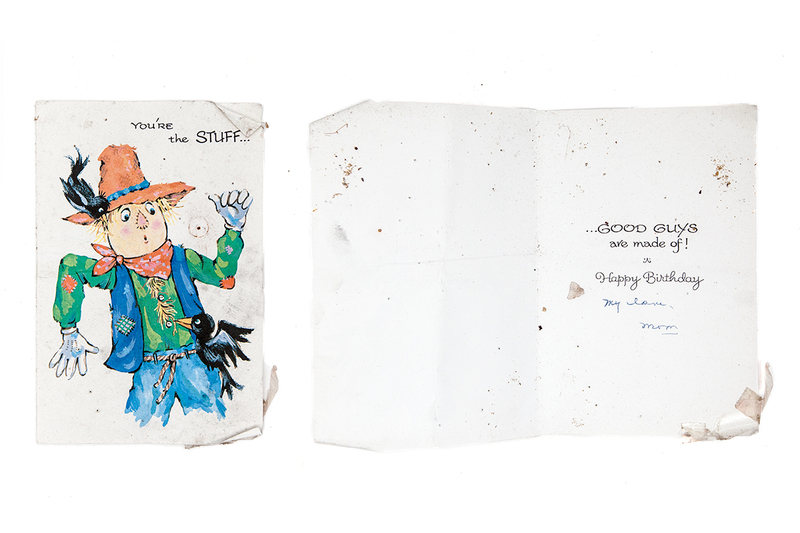 The finest of them is a series of thoughtfully designed and obviously professional works depicting scenes from the tales of Washington Irving. These and a similar set depicting the four seasons were painted in the 1940s by the Works Progress Administration muralist Victor Pedrotti Trent. 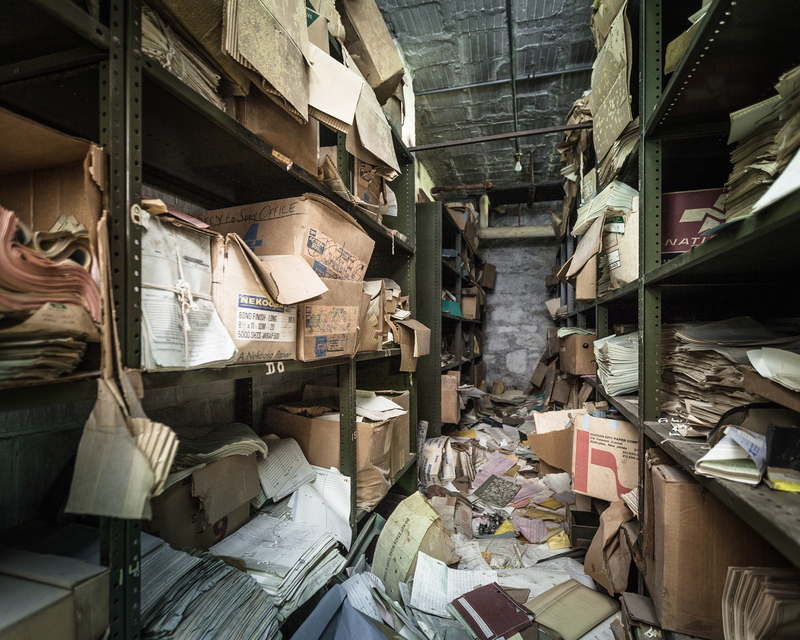 Much of the work is well-preserved, but some areas have suffered irreparable water damage. Years ago a study estimated that moving and restoring the paintings would cost $100,000, a prohibitive figure. Since then, there’s been little interest in preserving them. In one section of the mural depicting classic stories by Washington Irving, Rip Van Winkle awakes from a long slumber. Ichabod Crane flees from the Headless Horseman in this scene from “Sleepy Hollow.” Note the creepy face in the hollowed out tree. Some sections of the mural are heavily damaged by water and temperature fluctuations. Through the painted vestibule, beer bottle middens pile up in a relatively plain auditorium. The building is the oldest of several structures on the campus that catered to children with psychiatric disorders. A modern children’s center is still in operation at Rockland Psych, and another built in the 1960s is currently being leased as a filming location for the hit Netflix show “Orange is the New Black,” standing in for the women’s prison depicted in the series. The 1929 hospital was slated for demolition years ago, but that doesn’t appear to be happening any time soon. A mural with patriotic themes characterizes the boy’s wing of the structure. …beginning with the voyage of The Half Moon, a Dutch East India Company vessel. 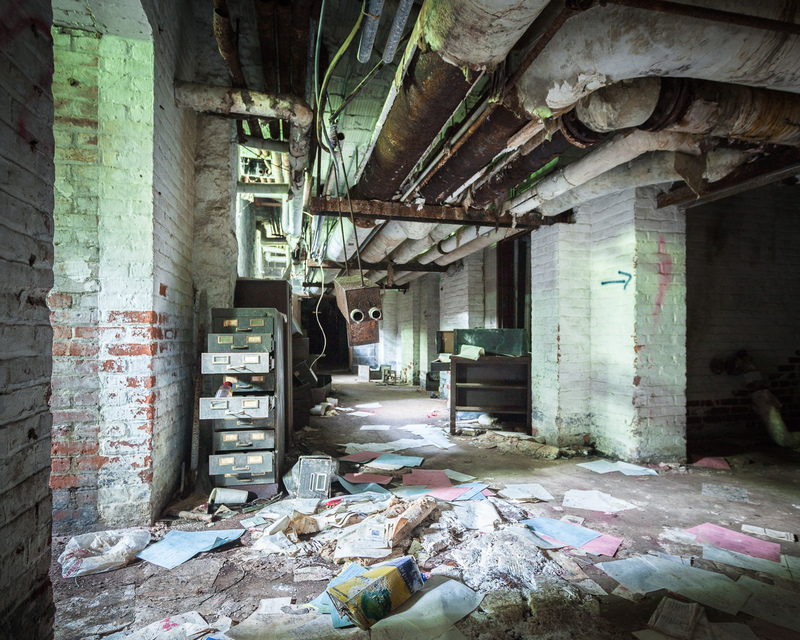 A few relics from the state hospital era lie scattered around the halls, likely moved here for an urbex photo op. 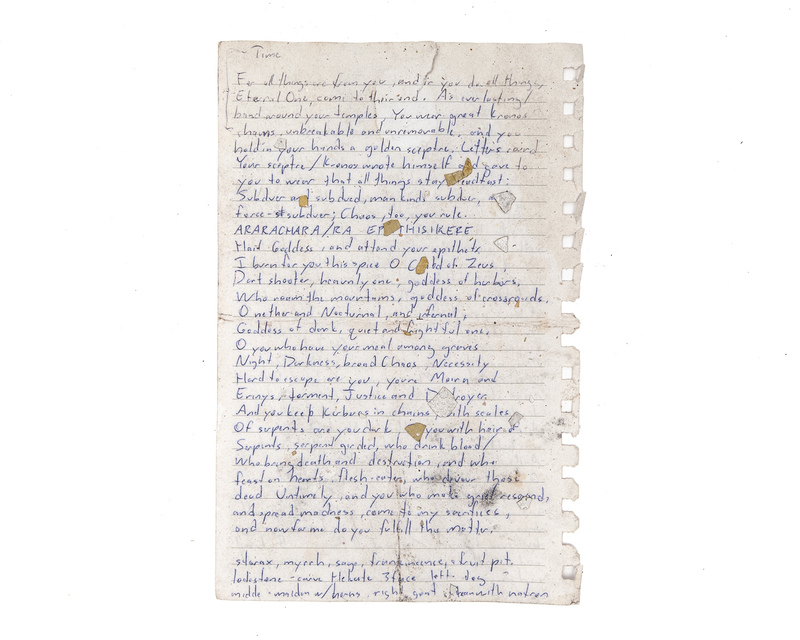 Paper stars wither like autumn leaves over a doorway in the former boy’s ward. IN OTHER NEWS… I’ve had a few spots open up on a tour of Dead Horse Bay I’ll be leading this weekend. It will take place Sunday, November 8th and we’ll be meeting at 10AM. It’s short notice, but I’d be happy to have a few more folks join in! Tickets available at this link. ALSO… I’m excited to announce Abandoned NYC just went into its second printing! Thanks to all who helped me reach this milestone by ordering a book, showing up to events, and supporting the blog. To those who haven’t gotten their hands on a copy, get your signed first edition while supplies last! Forested views from a lower floor day room at Sea View Children’s Hospital. At the turn of the twentieth century, tuberculosis was the second leading cause of death in the city and a major world health concern known to disproportionately affect the urban poor. In New York City, two-thirds of the 30,000 afflicted were dependent on city agencies for treatment. Growing concern from charitable organizations spurred the establishment of New York’s first public hospital designed exclusively to treat tuberculosis, care for the “sick, poor, and friendless,” and keep the epidemic under some measure of control by isolating sufferers from general hospitals. 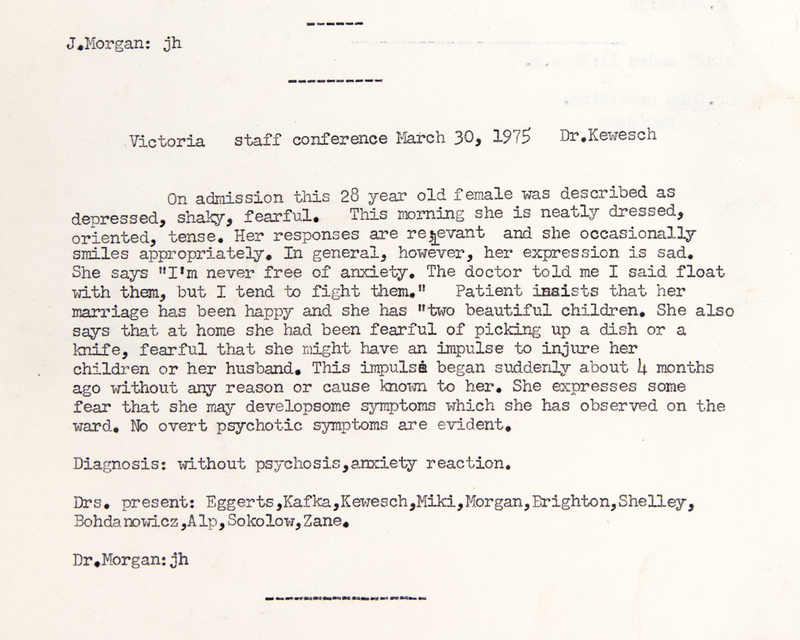 If you were diagnosed with tuberculosis in the early 1900s, your prognosis was grim. 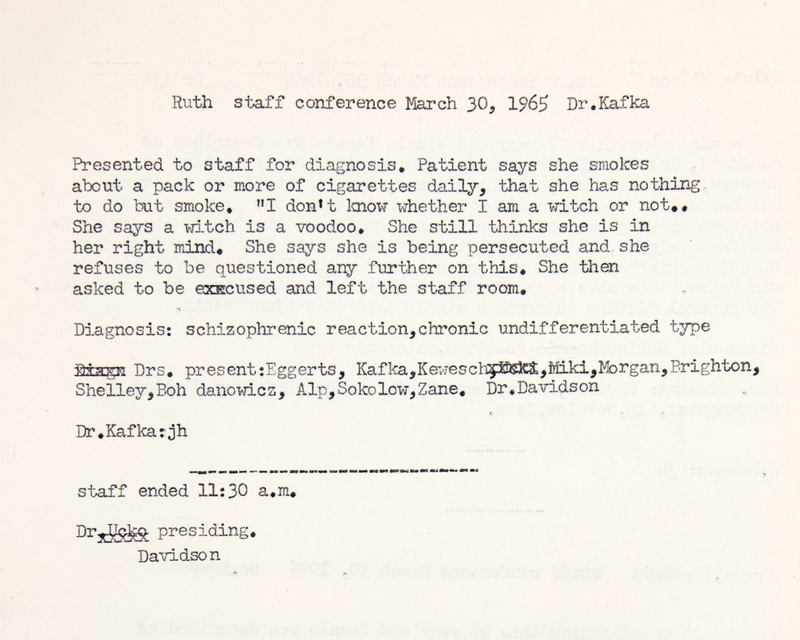 Lacking a cure, the only treatments thought to ease symptoms were fresh air, rest, sunshine, and good nutrition. A pleasant view was also considered essential for staving off depression. For this reason, hospital planners settled on a privately owned 25-acre hilltop parcel in rural Staten Island called “Ocean View,” just across from the already established New York City Farm Colony. The plot was surrounded by a vast expanse of forested land (known as the Greenbelt today) which enabled the hospital grounds to expand as necessary. When Sea View Hospital was dedicated on November 12, 1913, the New York Times called it “the largest and finest hospital ever built for the care and treatment of those who suffer from tuberculosis.” The Commissioner of Public Charities claimed it was “a magnificent institution that is vast, ingenious, practical, convenient, sanitary, and beautiful, the greatest hospital ever planned in the world wide fight against the “white plague.” Though the new facilities effectively eased the suffering of tuberculosis patients and provided housing for the poor, little could be done to actually save lives in the long term. Most eventually succumbed to the disease. Two window fixtures had vanished, offering an unobstructed view of the surrounding woodlands. Doorway into an open-air pavilion. In 1943, the development of the antibiotic streptomycin at Rutgers University led to a series of breakthroughs in the treatment of tuberculosis over the next decade, and much of that research took place at Sea View Hospital. The enthusiasm over these dramatic developments is captured in a 1952 report by the Department of Hospitals: “Euphoria swept Seaview Hospital. Patients consigned to death at the hands of the White Plague celebrated a new lease on life by dancing in the halls.” The transition was swift. By 1961, Sea View’s pavilions were practically emptied as patients miraculously recovered as a result of the new therapies. Today, a long-term care facility operates in several of the buildings and some structures have been repurposed by community agencies and civic groups, but much of the Sea View Hospital campus lies abandoned. Past a fenced enclosure delineating the active section of the hospital, the grounds give way to the bramble-choked wilds of the Staten Island Greenbelt. 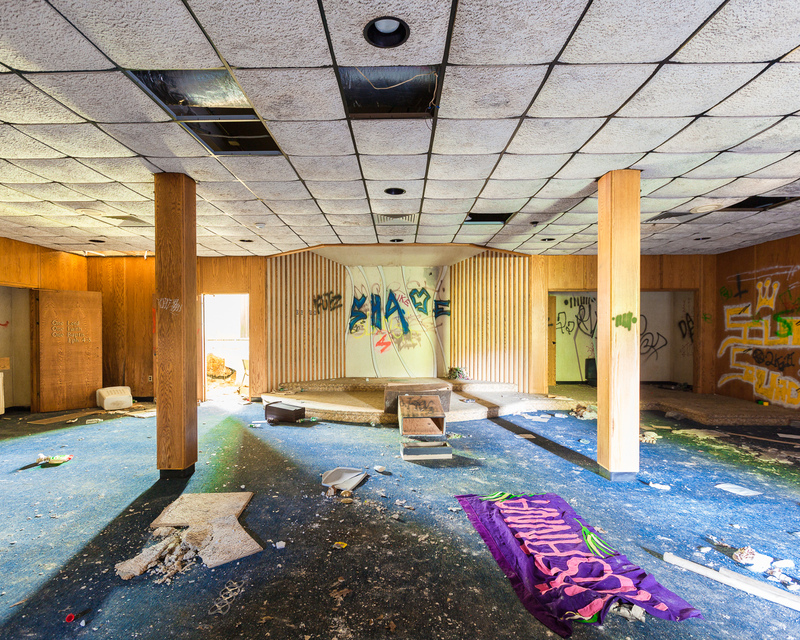 The creepy ruins of the old women’s pavilions situated on the northern border are a popular detour on hikes from the neighboring boy scout camp. To the east lies the imposing Children’s Hospital, completed in 1938 and abandoned in 1974. Its spacious, window-lined solariums are typical of earlier Sea View wards, flanked on either side by open-air porches which were occupied by recovering patients 24 hours a day during the height of the epidemic. In an otherwise clinical Landmarks Preservation Commission report published in 1985, the researcher notes that “the building rises from a deep slope… Wooded surroundings, particularly dense to the east and south of the building, enhance the sense of isolation.” The view he’s describing is indeed one of New York City’s most surreal (pictured below in 2012). The ominous Children’s Hospital, seen from a hilltop on the grounds of Sea View Hospital. Reuse of the structure seems extremely unlikely given the large number of abandoned buildings within the active hospital complex that would make better candidates for restoration. Area conservationists are fighting to keep the surrounding woodlands protected from developers by making it a permanent part of the Greenbelt network of natural areas, and the building itself is nominally protected from demolition as part of Sea View Hospital’s historic district designation. That doesn’t mean that the building won’t serve a purpose as it continues to crumble. As I’ve mentioned in previous posts, Staten Island teenagers have a long history of voraciously exploring (and vandalizing) their local ruins. 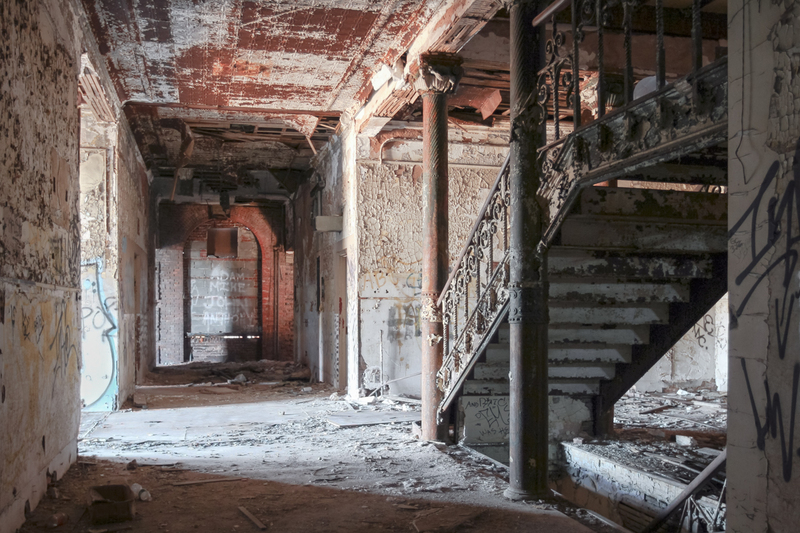 With the renovation of the Willowbrook State School in the 1990s, the later demolition of the Staten Island Monastery, and the impending restoration of the New York City Farm Colony, the isolated, under-the-radar Children’s Hospital may be next in line as the site of that requisite rite of passage. Only time will tell. There’s little to suggest the building was used exclusively as a children’s hospital in its last years of operation. Even the restrooms had windows for observation. 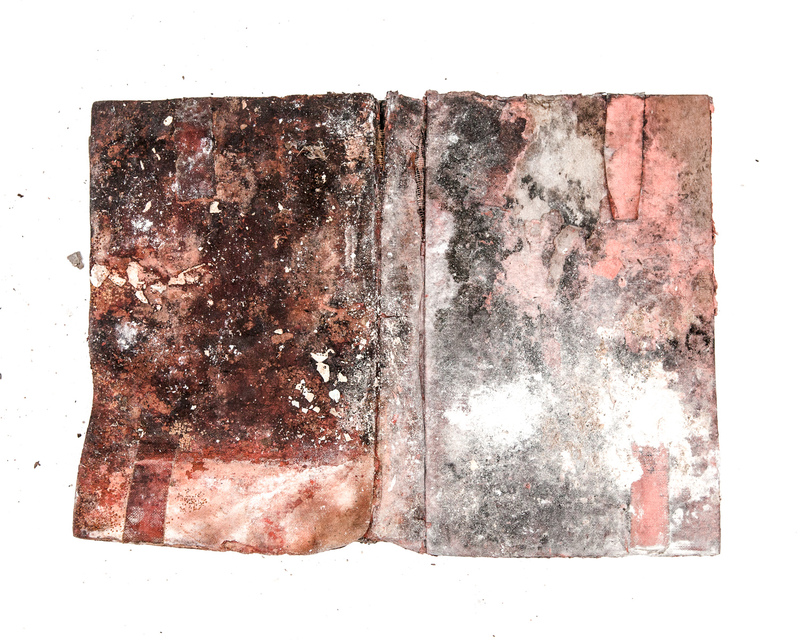 Drifts of plaster pile up on a table outside the darkroom. The upright piano, an abandoned hospital staple. “Dixie Cup for Dentures.” The name says it all. A storage room in the attic had been pillaged. A steep staircase led to the upper reaches of the utility floors. 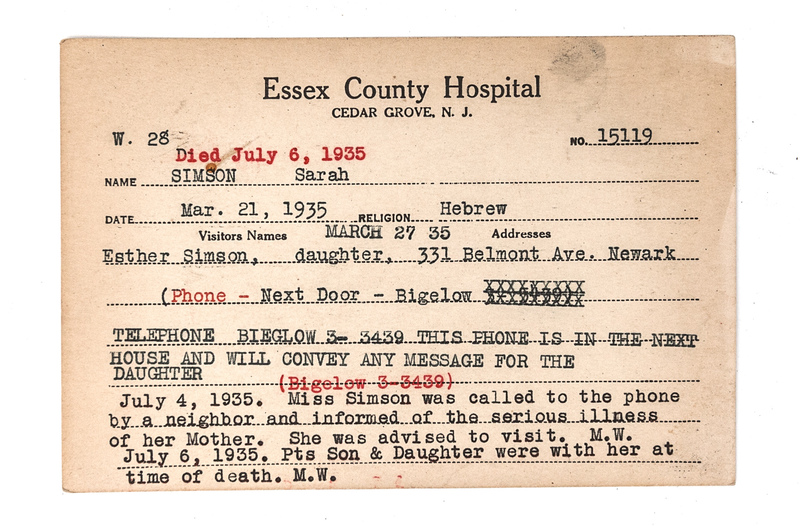 The last room I came to was the most surprising–a boarded-up dayroom piled several feet high with hospital records. IN OTHER NEWS… my friend Oriana Leckert‘s book “Brooklyn Spaces” is out this week. We’re a bit like kindred spirits, Oriana and I, but she goes more for the crowded, lively, and creative than the empty, eerie, and decrepit. The (50!) places profiled in the book show the authentic, human side of the global phenomenon that is “Brooklyn cool,” highlighting the heartfelt endeavors of a wave of culture makers that migrated to the borough for cheap rent and fashioned a network of bustling performance venues, art enclaves, and meeting places out of Brooklyn’s post-industrial landscape. Her obvious passion for offbeat museums, community gardens, communal living spaces, and out-there artist residencies is beyond infectious. Do yourself a favor and pick up a copy! And head to what I’m sure will be a raucous, sweaty launch party on May 30th. Order Abandoned NYC the book here. In its final years, the Frost Memorial Tower of the old Smith Infirmary looked like the quintessential haunted house. 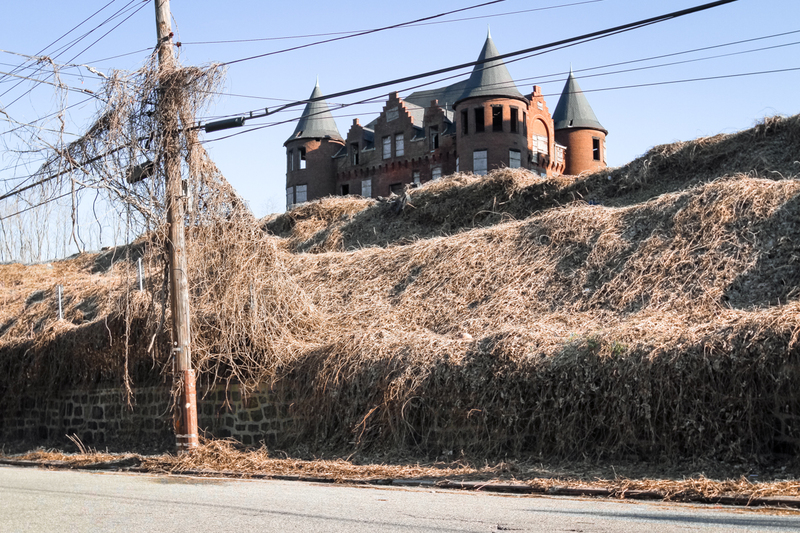 For 124 years, a castle with many names loomed over the quiet neighborhood of Thompkinsville, Staten Island. Perched on a six-acre hilltop covered in creeping vines, the striking red brick chateau could have been the backdrop of a fairy tale until thirty years of neglect made it the perfect setting for a Gothic horror. On an early March morning in 2012 while most of the island slept, wrecking balls converged at the Frost Memorial Tower of the old Samuel R. Smith Infirmary. In a matter of hours, the hospital was brought to the ground. Dozens gathered to watch her fall. The stately Infirmary in its youth. In 2011, the weight of winter snow caused the roof of the building to cave in. The same year, Hurricane Irene caused further damage, dashing any hope of saving the structure. Today, the rubble-strewn lot is a symbol of lost history and lost hope for members of the Preservation League of Staten Island and their supporters, whose passionate and repeated efforts to save the building did little to sway the resolve of the Landmarks Preservation Commission. City engineers who inspected the structure confirmed that the building was in a state of progressive collapse, and would have proven a hazard to firefighters entering the building in the event of a blaze. Some elements were salvaged prior to demolition. Named for a doctor who dedicated his life to the treatment of the poor, the Samuel R. Smith Infirmary was founded in 1863 as the borough’s first private hospital. Principally funded by lavish charity balls, the organization was the pet project of the borough’s high society, known as the “Pride of Staten Island.” By the turn of the twentieth century, the Infirmary had outgrown its former home, and the cornerstone was laid for a new building, named the Frost Memorial Tower in honor of the wealthy benefactor who had gifted the hilly plot of land. 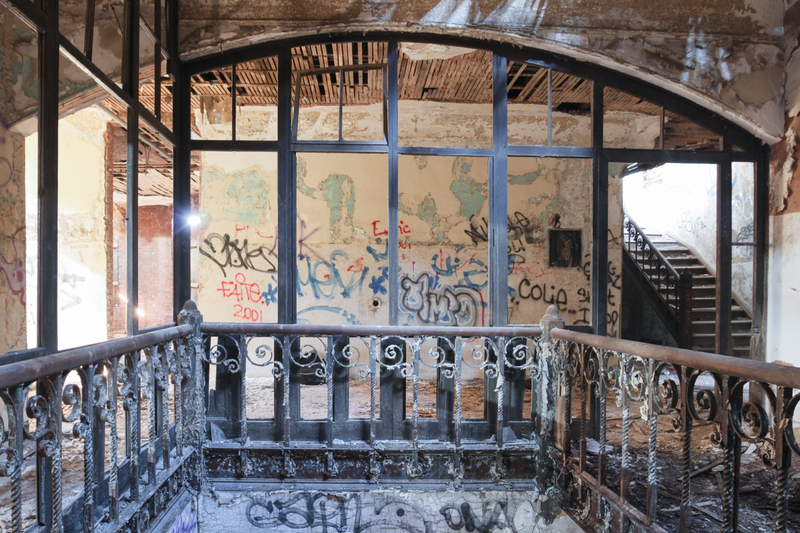 It was destined to become one of Staten Island’s stateliest buildings. A band of sunlight illuminates a doorway to ghostly effect. This grand staircase was the interior’s most striking feature. By 1974, the once-rural land surrounding the complex had become densely populated, leaving little room for expansion. At the time, one hundred patients were waiting daily for admission, and parking had become a serious problem. The campus was abandoned in 1979 when the hospital relocated to a new building on Seaview Avenue. By the turn of the 21st century, the property had accrued millions of dollars in tax liens, falling into an irreversible state of disrepair. At the time the infirmary was built, corners were thought to harbor germs, so many hospital rooms were designed with circular walls. 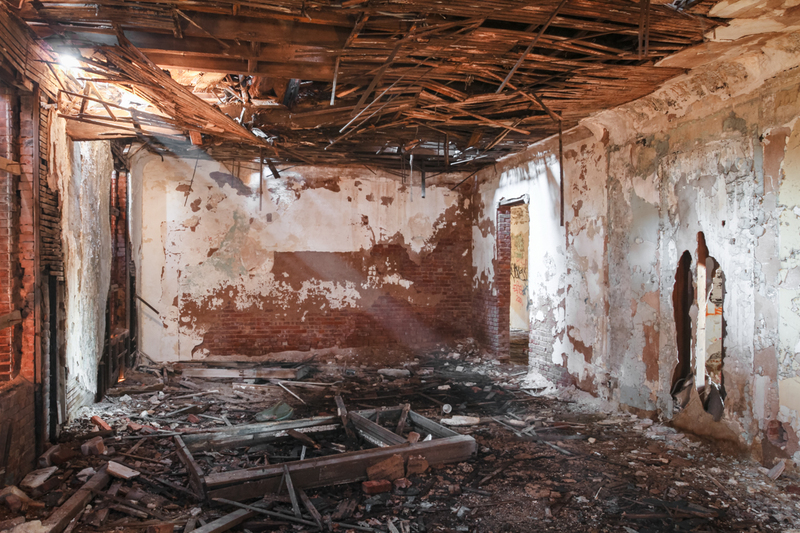 Through 33 years of abandonment, the degraded walls, slumping ceilings, and precarious floors of the Infirmary were utterly devastated by the elements. 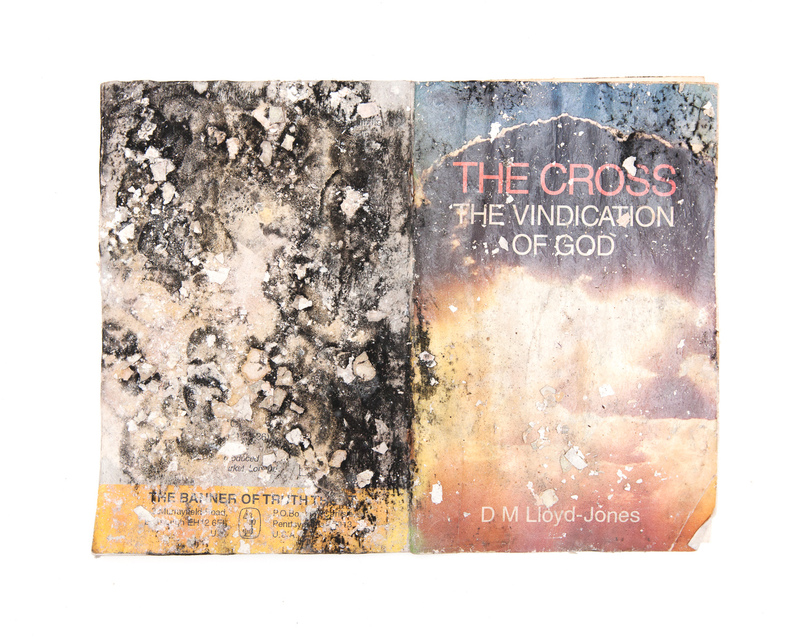 The smell of mold and rot permeated the interior. Wind blustered through its second floor landing, causing boards and debris to smack and rattle at odd intervals. These were the dying breaths of a squandered architectural treasure. Rest in pieces, Staten Island Castle. 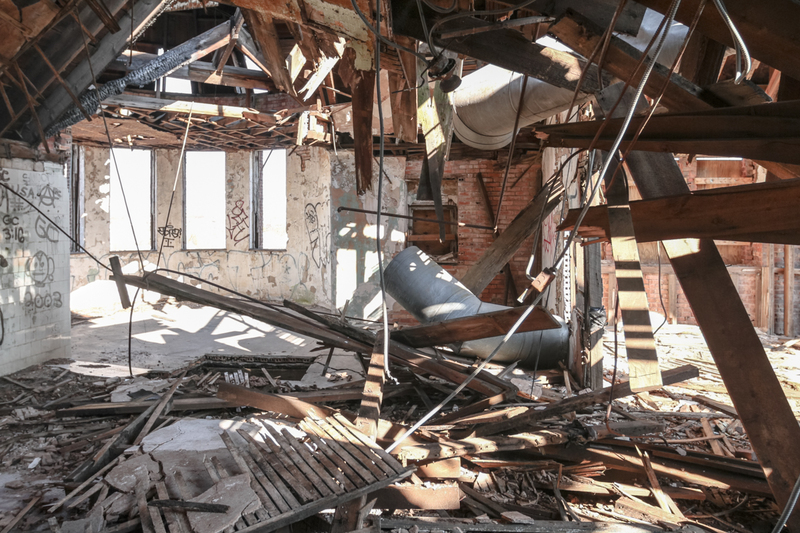 Where a ceiling had collapsed on the top floor, walls gave way to open sky amid a mass of broken beams. A tuberculosis pavilion crowns the treetops of North Brother Island like an Aztec ruin. 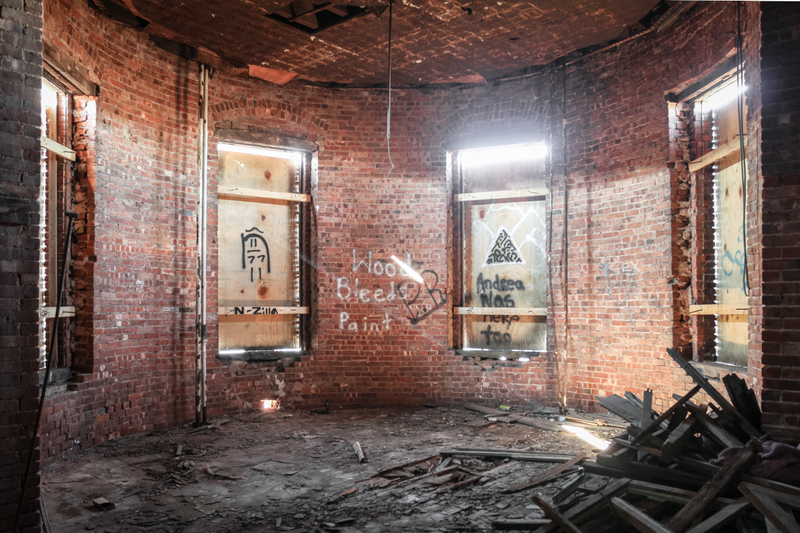 Most New Yorkers have never heard of North Brother Island, but they should take comfort in the fact that new trees are growing and manmade things are going by the wayside just a stone’s throw from Rikers and a few miles from LaGuardia Airport. New York City’s abandoned island proves that as much as we think we have a handle on things, nature is never far behind. Just give it time. Many of the older structures are splitting at the seams, but there’s little hope or interest in preserving them. 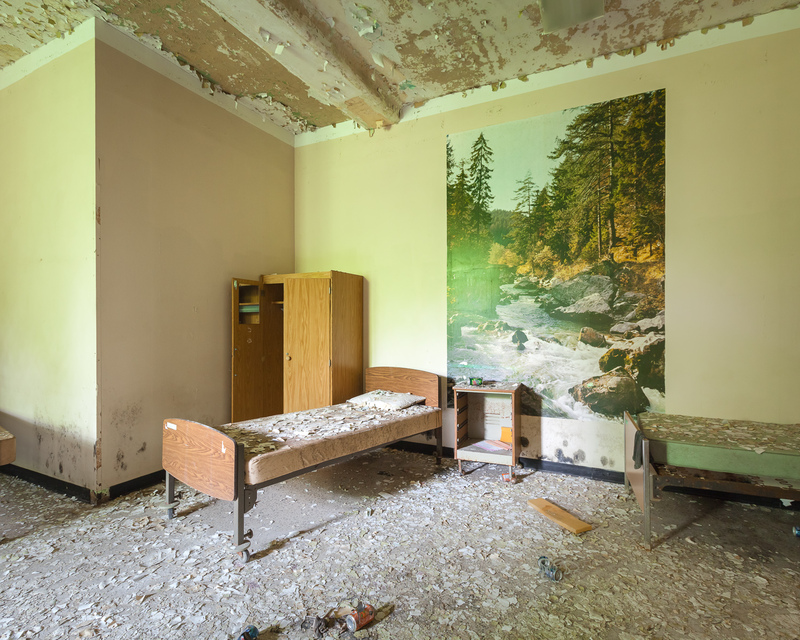 In the case of North Brother Island, it took fifty years to transform a sparsely planted hospital campus to a bona fide wildlife sanctuary surging with fresh green life. 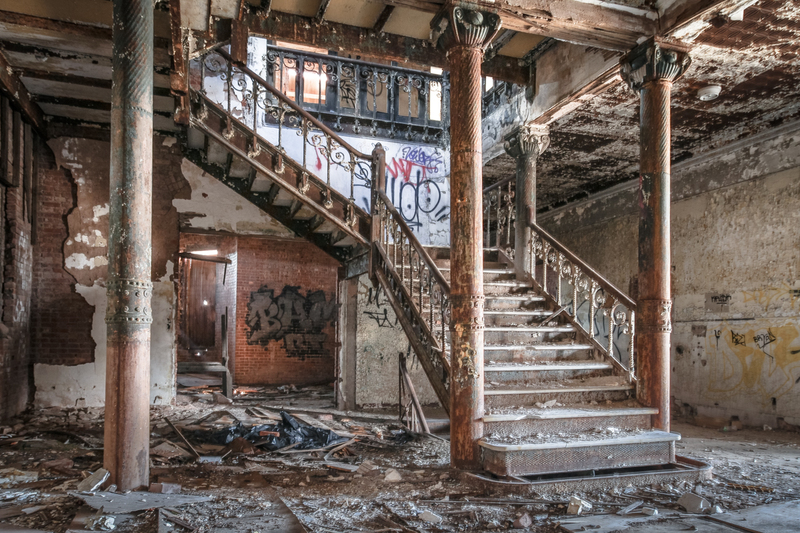 Established as a city hospital for quarantinable diseases in 1885, it became a disreputable rehab center for adolescent drug addicts prior to its abandonment in the 1960s. To add to the intrigue, the island was the site of a catastrophic shipwreck and the residence of the notorious Typhoid Mary. (For a detailed history of Riverside Hospital, see Ian Ference’s thorough account over at the Kingston Lounge.) Today, opportunistic ivy floods the old lawns and races up the corners of the dormitories. Elsewhere, invasive kudzu—a Japanese import—holds at least an acre of land in its leafy grip. Few animals roam this untrodden landscape, with the exception of a handful of raccoons that took a dip in the East River and discovered the greenest place around. An airplane takes off from nearby LaGuardia airport with a gantry crane in view. Even though it’s one of the least inhabited places in New York City, you can still find pathways on North Brother Island. Parks employees and occasional visitors leave a network of rabbit trails on the forest floor, but they taper off on the south side, where a few ruins beckon you further into the weeds. I trudged through the brush for over an hour only to end up right back where I started, and it wouldn’t be the last time I was forced to admit defeat to the thorny wilds of Riverside Hospital. The island plays tricks on you, but it’s liberating to lose your way. Surrealism made doubly surreal in a patient mural. 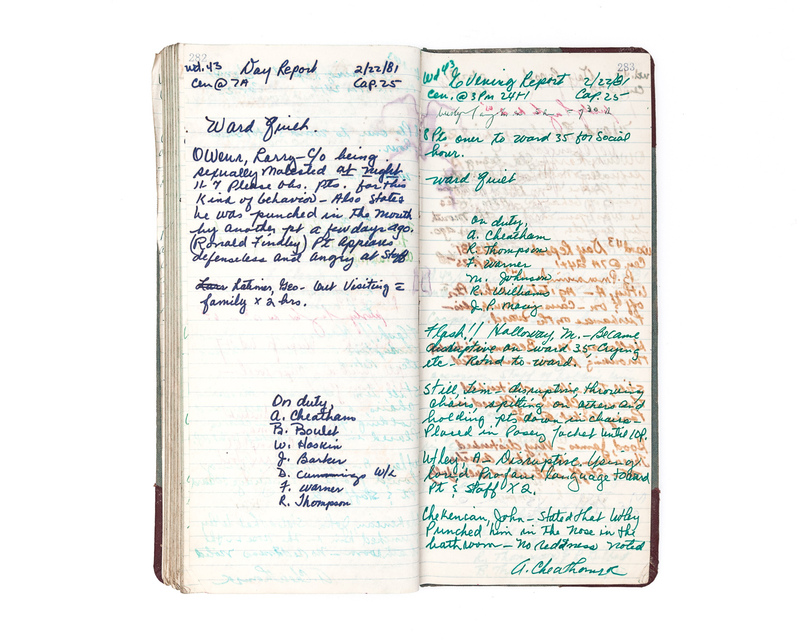 The largest and most intriguing book I’ve ever seen was filled with the most mundane details. 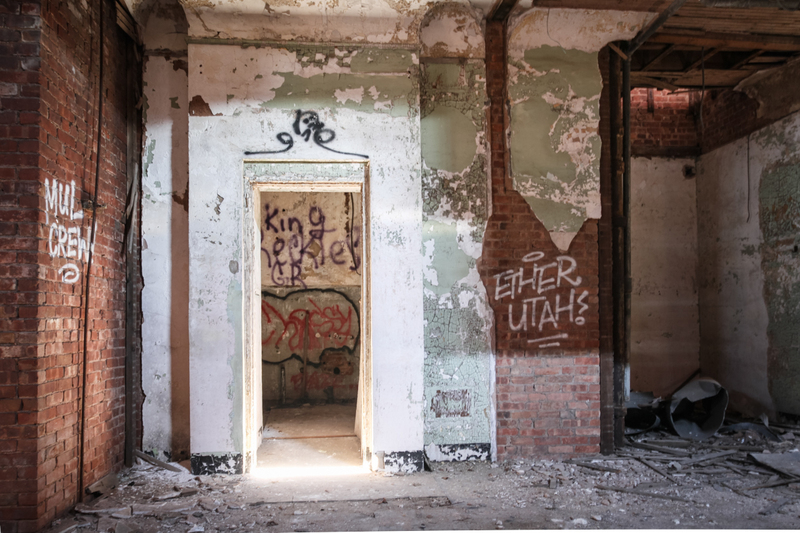 If you never make it to North Brother Island, take heart in the fact that it’s best appreciated from afar, where distance allows the imagination to fill in the obscured reaches beneath its canopy and populate the crumbling towers visible on its shore. An abandoned island is the most natural thing in the world to romanticize, but in the light of day, the enigma dissolves. As menacing as the old buildings may appear, they’re ultimately indifferent. Green leaves and blue skies illuminate a crumbling auditorium with jewel tones. Metal barricades in an isolation room kept residents from breaking the windows. …but the island exhibits a near-complete lack of graffiti. A spiral staircase in the former Nurses’ Residence. Walls were stripped to their skeletons in this dormitory. A doorway holds steady in a collapsed section of the Nurses’ Home, where a few saplings have taken root.